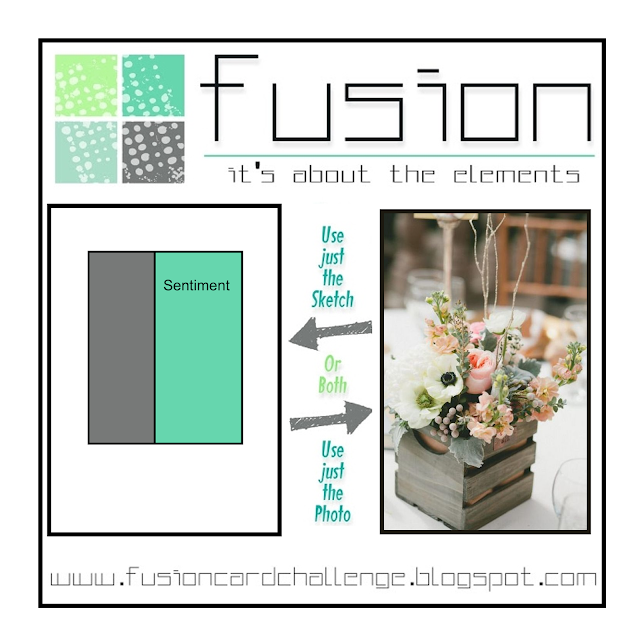 There’s a challenge at Fusion Card Challenge that is right up my alley. Rustic Flowers is what their challenge is called. Rustic seems to be the theme I’m drawn to lately. I was going to use both the sketch and colours from the inspiration pic, but my card somehow grew too many layers and I had to just go with the inspiration pic. 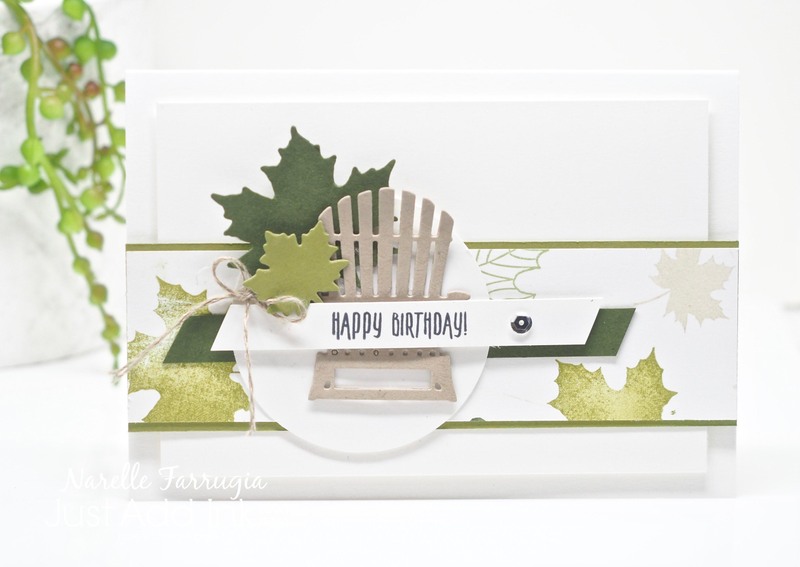 Colorful Seasons and Seasonal Layers Thinlits Dies are a great set for that rustic feel. I used a combination of sizes of the leaves dies. 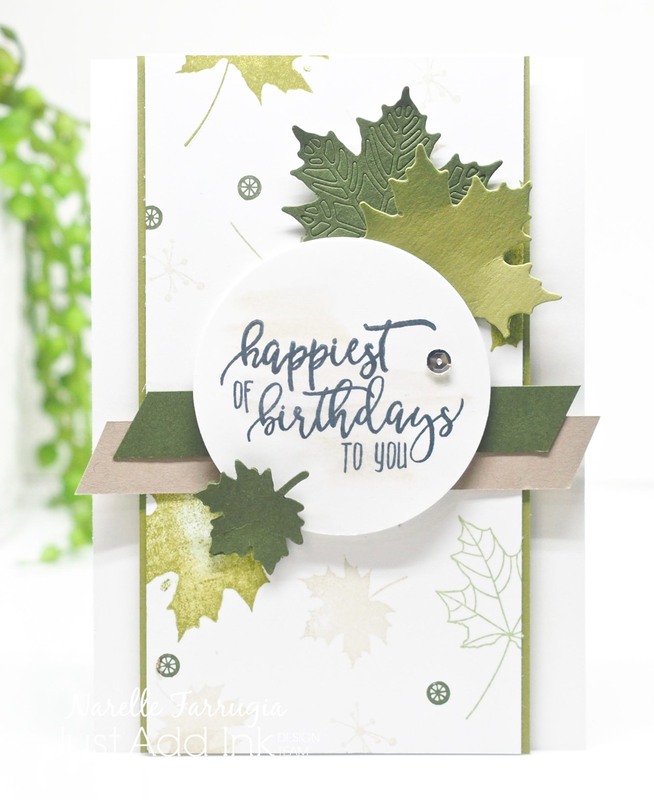 The smallest leaf is made with Mossy Meadow Cardstock. To create the largest leaf, I applied a combination of Crumb Cake, Old Olive and Early Espresso Inks directly to my silicone mat and then spritzed with water. I then applied some Whisper White Cardstock directly on to the ink. I waited for it to dry and cut with my large die. I then took the branch die and ran it through my bigshot with Early Espresso Cardstock. The strip of designer series paper I’ve used is from Wood Textures Designer Series Paper Stack. I also added a strip of Sahara Sand Cardstock. I then added some ink splatters to the background from Timeless Textures and Love What You Do. The sentiment I’ve used (again) is from Picture Perfect Birthday. To finish off my card I added some Linen Thread to go with that whole rustic feel. It’s Wednesday! 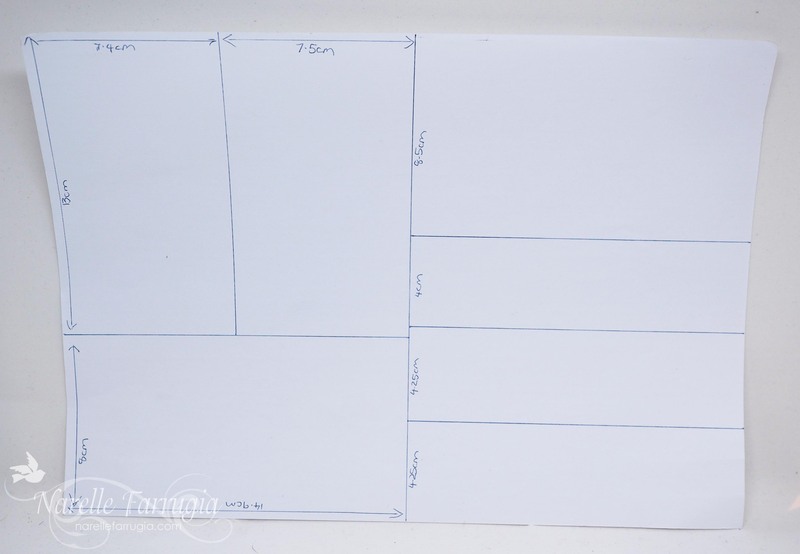 Wednesday’s on my blog mean a new sketch at Freshly Made Sketches. 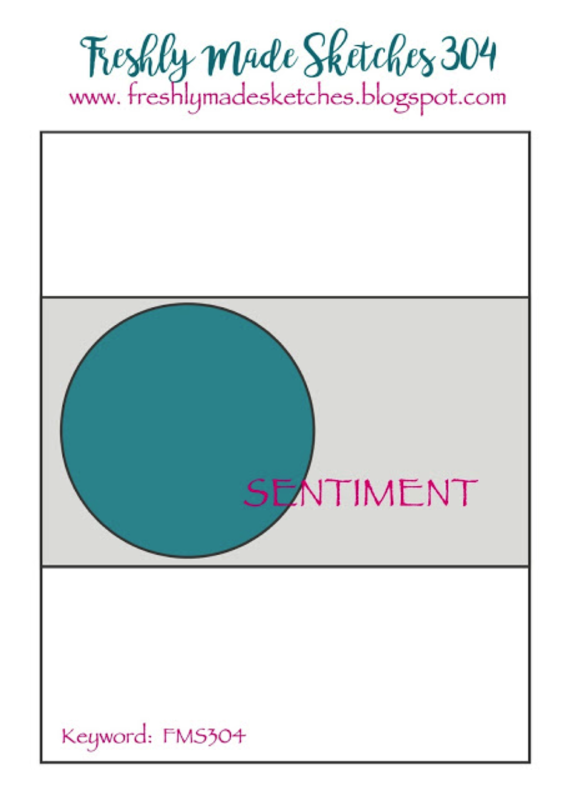 The sketch, as you will see below, has a really cool and interesting design. Jen Brum, one of our talented Clean Team Designers has designed it. 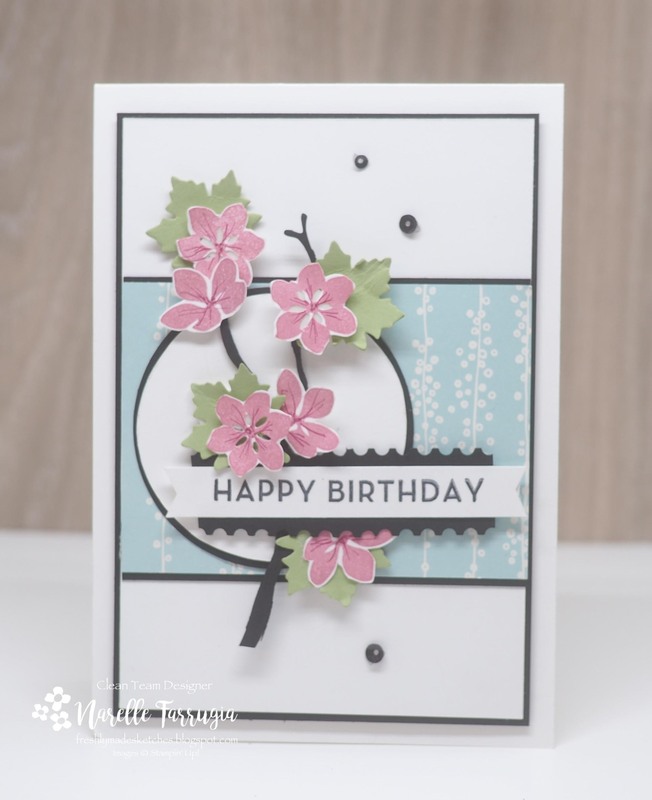 Jen’s blog is full of wonderful and elegant cards. Pop over to her blog by clicking here and take a look. Jen’s sketch gave me an opportunity to add to my Christmas card pile. I think this brings me to a total of 5. Yep, I’m totally on a roll and may well get to 10 before December – my target is about 25…..
On to my card. The snowflakes I’ve stamped on my card are from Colorful Seasons. My snowflakes are inked with Soft Sky Ink. 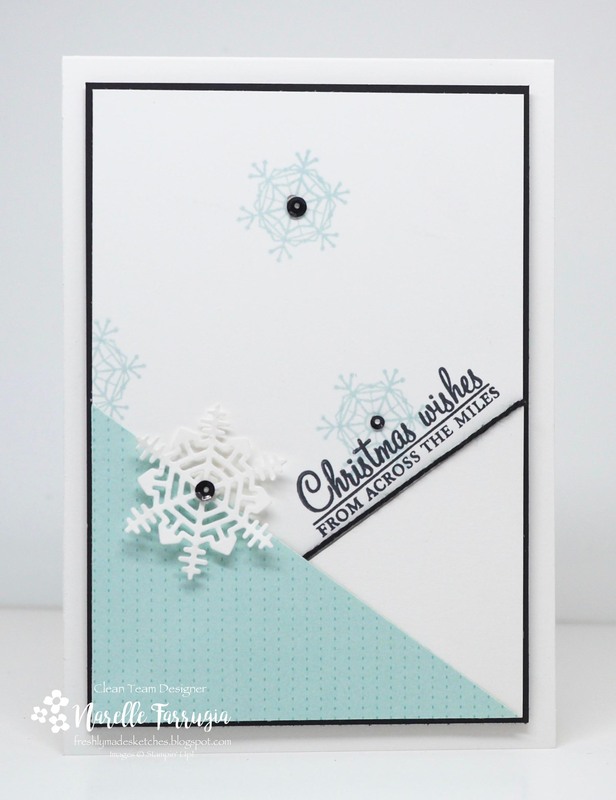 The Whisper White diecut snowflake is cut with my Seasonal Layers Thinlits Dies. I really love the sentiment I’ve used on my card. It’s from Holly Berry Happiness and I’ve stamped it in Black Memento Ink. I added some solid Black Bakers Twine along the Whisper White diagonal cardstock I cut to tie it in with my black layers. I then added some sequins to the centres of the snowflakes to add some bling and to also hide the mini dimensional I have used on my raised snowflake. As always, the Clean Team have nailed the sketch with their cards. 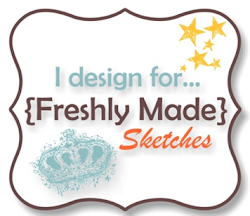 Head over to Freshly Made Sketches and see what they’ve created. I then decided on a stamp set and colours I would use. The stamp set I settled on was Stampin’ Up!s Colorful Seasons. 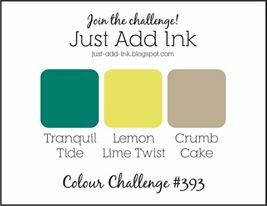 The ink colours I used were – Crumb Cake, Old Olive and Mossy Meadow. I randomly stamped the leaf stamps first and then the little wheel like stamp to fill in the gaps. The littlest leaf stamp was inked up with Crumb Cake, but this doesn’t really come through in my photo. In total I created seven cards. On the first of my cards, I have layered my stamped OSW panel in the centre of my card. I added a sentiment from Picture Perfect Birthday on a circle and added a light Crumb Cake watercolour behind the sentiment. I then set my big shot into action and cut loads of leaves with my Seasonal Layers Thinlits Dies. My leaves are made from Old Olive and Mossy Meadow Cardstock. My second card also has the OSW panel in the centre of the card. I added some Linen Thread and the chair die cut from Seasonal Layers Thinlits Dies to my card. I added more leaves and a sentiment from Picture Perfect Birthday. I flipped my next card to mix it up and added banners, leaves, a sentiment from Picture Perfect Birthday and a Linen Thread bow. I have given this card a side panel with my OSW strip. Along with a sentiment stamped on a circle, I added a strip of Burlap Ribbon and a banner. This next card has a more clean look as I have used a thin strip of my OSW on the right side of my card. As on my other cards, I have given my strip a mat of Old Olive Cardstock. By adding the mat I think it makes the OSW strip stand out more against the all white background. 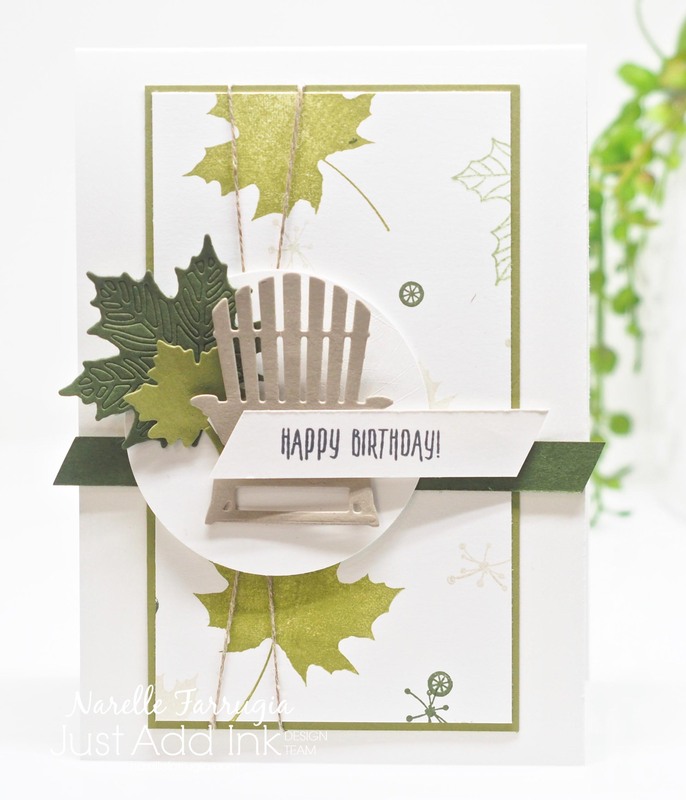 I’ve used the chair die cut from my Seasonal Layers Thinly Dies on this card. Again I have added some leaves, banners and a Linen Thread bow. 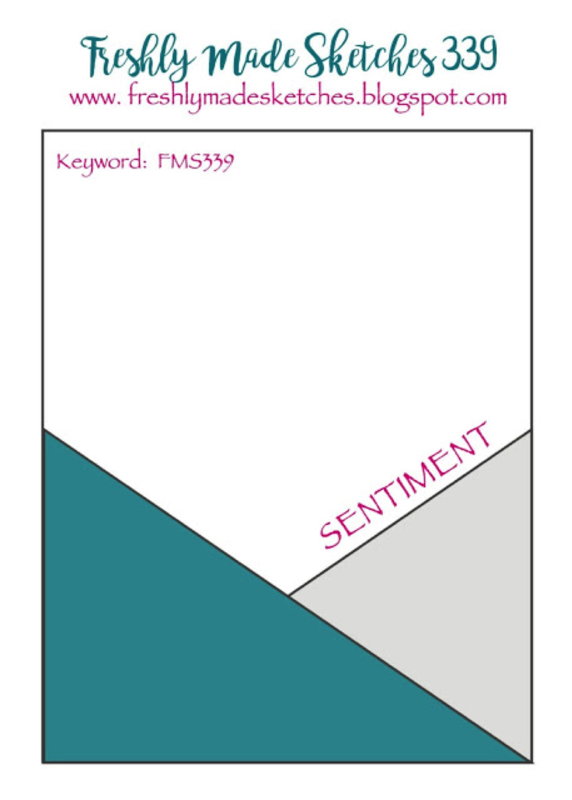 The layout on this card was one that I remember using in a previous sketch challenge at Freshly Made Sketches. 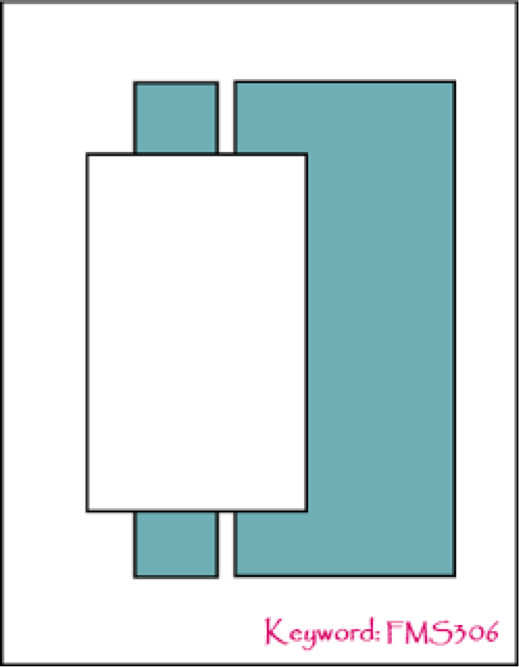 I love this layout – to create this, I took the last of the thin strips from my OSW and cut it evenly into three rectangles. I matted them with Old Olive Cardstock and placed them as below. I added some banners and a sentiment and my card was done. Phew! That’s lots of photos isn’t it? 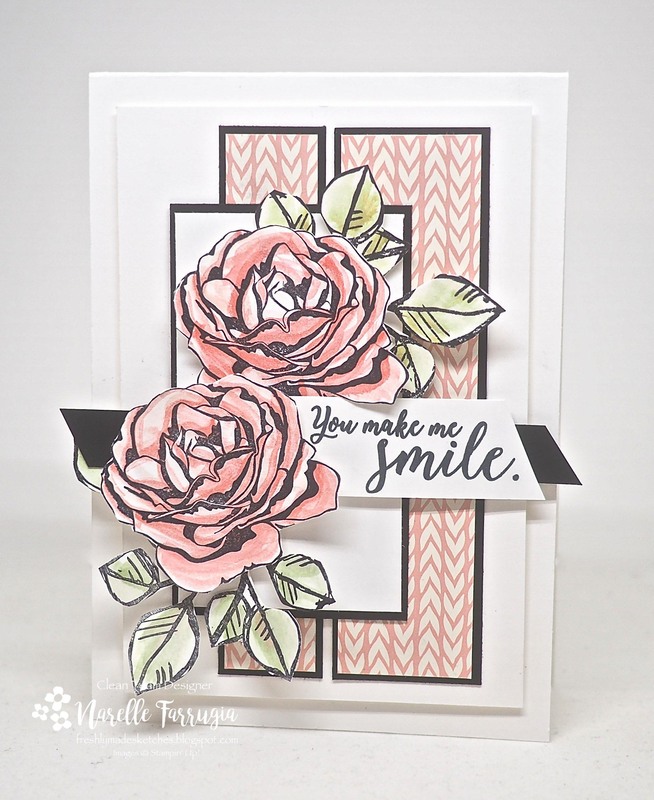 The girls at Just Add Ink have created gorgeous cards with this weeks challenge. Head over to Just Add Ink and take a look. When you go on holidays and have left yourself only 1/2 hr to pack up some Stampin’ Up! products, you kind of have to improvise when you realise you left your big shot on your craft room desk…. I packed my Colorful Seasons stamp set, but forgot the matching thinlits. To create my leaves I started off with a silicone mat and added ink from all three challenge colours by pressing the ink pads directly on to the mat. I then spritzed with water and moved my mat around to blend the colours. I then pressed some white cardstock onto the mat and waited for the cardstock to dry. 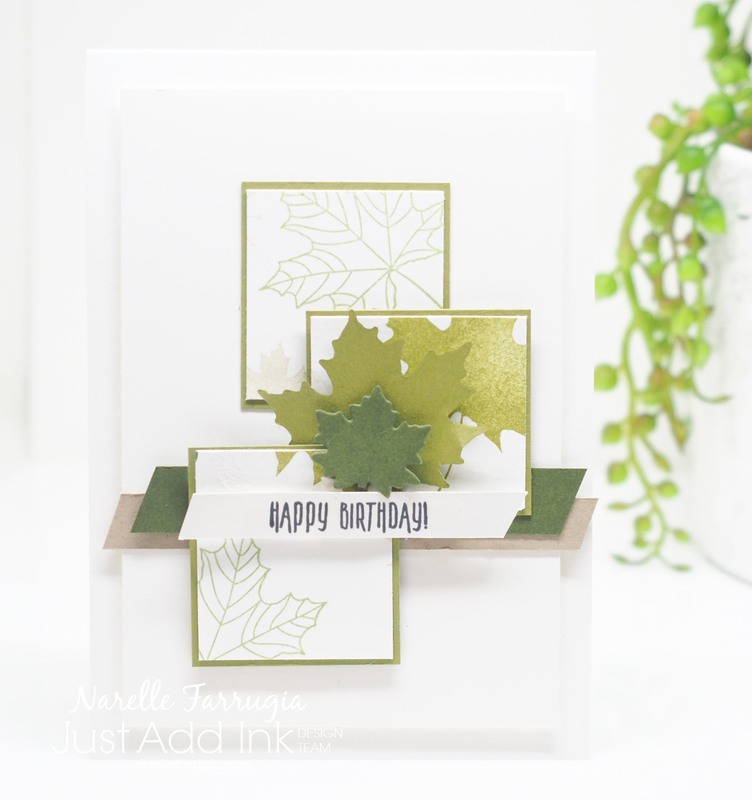 The larger leaves were easy to stamp and fussy cut, but the smaller leaf stamp is a solid one with no inner leaf lines and no outline. To create the smaller leaves, I stamped the larger leaf again. I then took the smaller leaf stamp and rolled the outside of the stamp on my Black Stazon Ink pad. 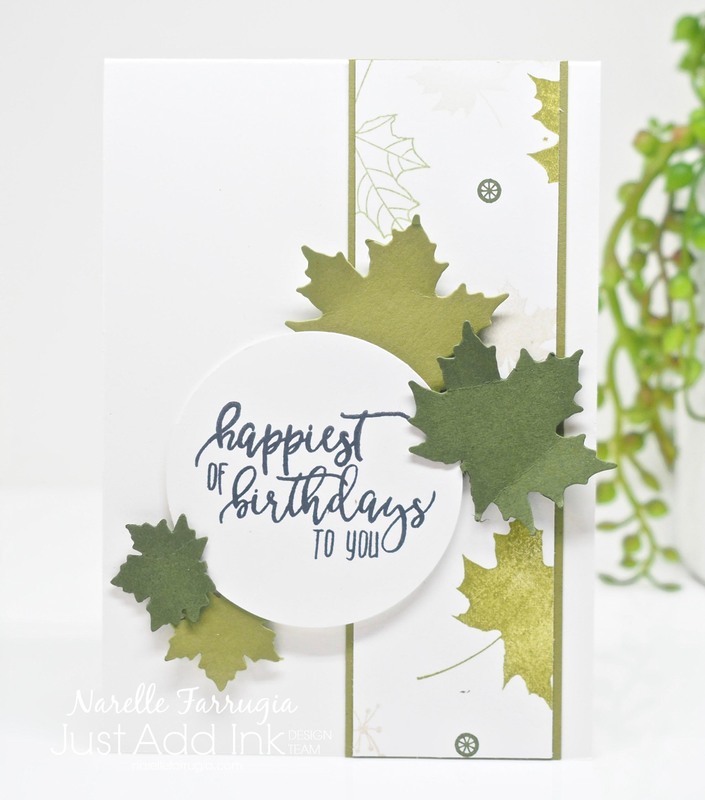 This gave me an outline that I then stamped over the large leaf stamp. I then had an outline and inner leaf lines that I was able to fussy cut. Does that make sense? It took a little longer to make them, but as I’m on hols, I didn’t mind the extra minutes playing around. I then layered with some Tranquil Tide cardstock, a Crumb Cake Label punch, some Lemon Lime Twist Ribbon, Whisper White Bakers Twine and a sentiment from Colourful Seasons Stamp Set. I forgot to pack all other embellishments, but luckily I found some sequins floating around in the bottom of my tool bag. Note to self – be more prepared when going on holidays next time! 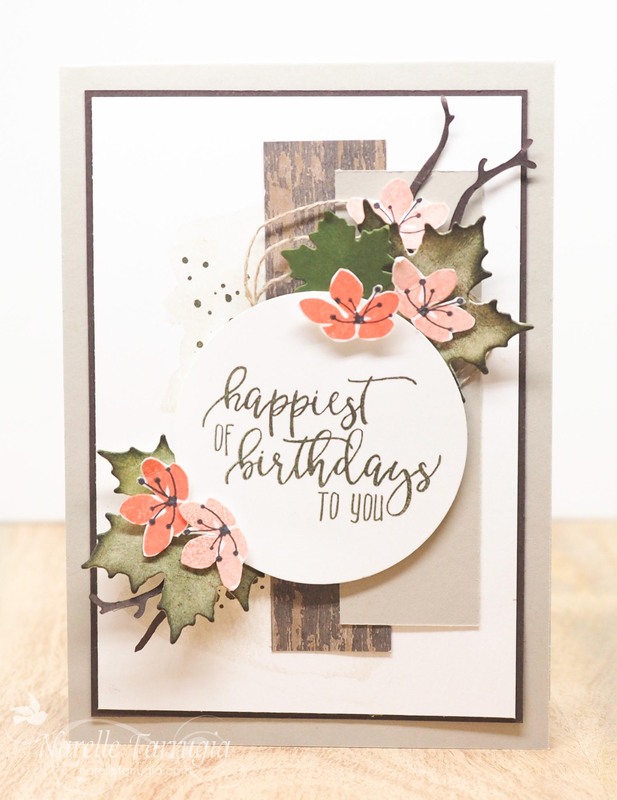 The Just Add Inkers have created gorgeous cards to inspire you. Head over to Just Add Ink and take a look at their wonderful projects. So many possibilities with this challenge! 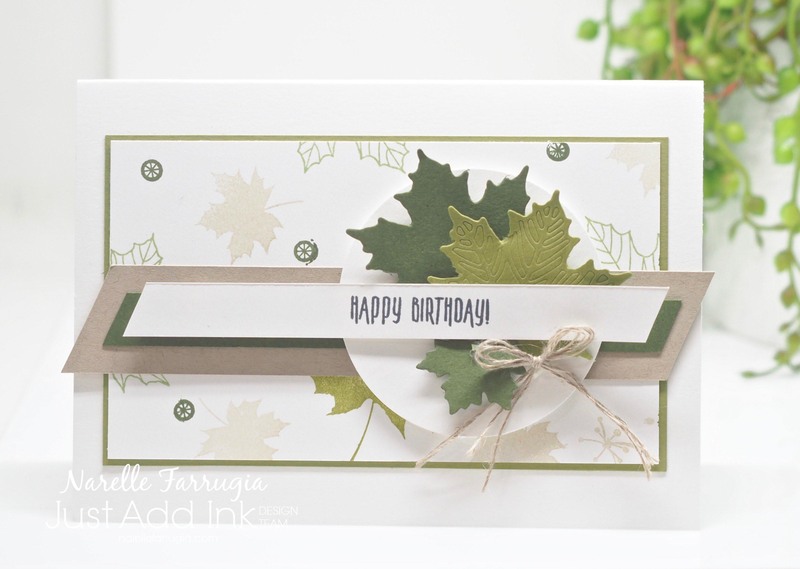 I chose to create a card using a Stampin’ Up! stamp set called Daisy Delight. My daisies are stamped in Black Archival Ink and watercoloured with Hello Honey Ink. The daisies are punched with my Daisy Punch. I’ve used a Faceted Gem Embellisment for the centre of my daisy and my leaves and branch are cut with Seasonal Layers Thinlit Dies. I had two little leaves coloured and sitting on my desk that I had coloured for another project and never used. If you look closely you should be able to see them! I then used my Pattern Party Decorative Mask and Embossing Paste to create a brick background – really just to add a little bit of interest to the background. 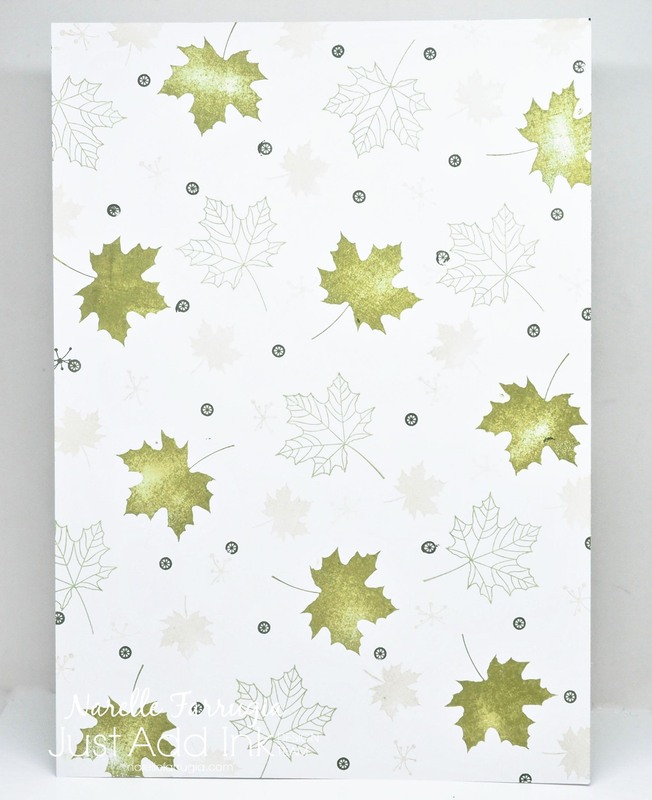 The designer series paper I’ve used in the background is from Fresh Florals Designer Series Paper Stack. I think Lemon Lime Twist may’ve taken over from my previous favourite green – Pear Pizzazz. I then stamped the “Thinking of You” sentiment from Colorful Seasons. The girls at Just Add Ink have created gorgeous cards to inspire you, so head over to Just Add Ink and take a look. We would love it if you could join us with this Just Add D challenge.